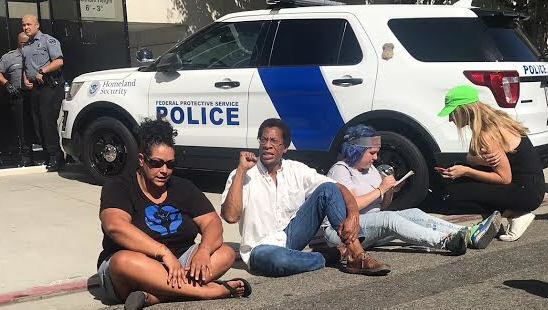 On Sept. 11, LA cops arrested CJ Fitisemanu (far left) and WWP member John Parker (center) for blocking entrance to Metropolitan Detention Center Almeida, in support of Occupy ICE. Occupy ICE Los Angeles called a protest press conference on Sept. 11 at the Metropolitan Detention Center. The purpose was to bring awareness that the day remembered by many as the anniversary of an “act of terrorism” in the U.S. actually led to the creation of a terrorist organization in 2003 known as ICE (Immigration and Customs Enforcement). 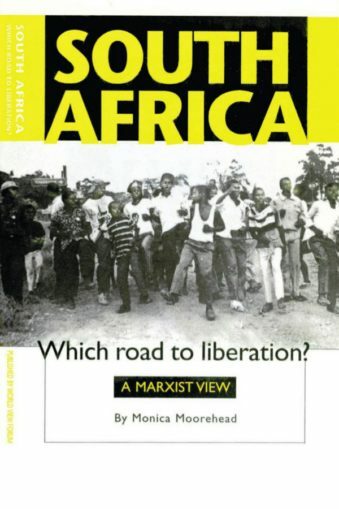 Sept. 11 was used by the U.S. to fuel more imperialist wars that create the crises and conditions that force people to become immigrants and refugees in the first place. Now ICE kidnaps and incarcerates those very im/migrants. The Occupy ICE LA demands were to close all detention centers, end family separation, and abolish ICE, the police and the Pentagon. Several organizations hosted and supported the press conference, including Humanity First, American Indian Movement SoCal, Committee in Solidarity with the People of El Salvador, Black Lives Matter, Assistance for the Resistance, Puerto Ricans in Action, Union del Barrio, FIRE (Fight for Im/migrants and Refugees Everywhere), Democratic Socialists of America and Workers World Party. The National Lawyers Guild was also present. John Parker of WWP spoke at the press conference on the role of U.S. imperialism in forcing migration, the war that targets Black and Brown people within U.S. borders, and the necessity for people to resist these terroristic policies and close down ICE by any means. After the press conference, attendees collectively decided to take direct action to shut down the ICE facility. First, several banners were used to block the Alameda entrance to stop a Department of Homeland Security van from leaving the facility. Then DHS officers started pushing and throwing people out of the way and into the street, ultimately arresting several people. But the people’s action forced the cops to put the main entrance into lockdown. This, ironically, would later result in three Orange County sheriff’s buses, the cars of some government “employees,” and several DHS vehicles being blocked and denied entry. DHS agent Jason Lynd, who is known for his white nationalist tattoos, and another officer then used their vehicle to drive over and destroy a memorial that had been placed at the Occupy ICE encampment on Aliso Street. Finally, all three entrances were taken by the people. When an escalation occurred between the demonstrators and cops at the Temple Street entrance and DHS staff became more violent, the protesters took direct action, which shut down that entrance entirely. After that, several state agencies got involved, including officers from DHS, Los Angeles Police Department, LA County Sheriff’s Department, U.S. Marshals and the Department of Justice. After all entrances to the facility were successfully shut down for a large portion of the day, LAPD arrested CJ Fitisemanu and John Parker. John Parker said, in part, after his arrest: “Officials working at the Metropolitan Detention Center, the LAPD and whatever government entity was advising these forces, seemed unprepared for the level of militance by activists and their organizations on the day that facility was essentially shut down by midafternoon. … The participants of this demonstration were determined to block all three of the entrances into the Detention Center, in spite of the shoving, even if it meant arrests. This action truly demonstrated the movement chant, “When we fight, we win.” Righteous people’s resistance shut down one of the state’s detention centers in Los Angeles for almost an entire day. A total of four people were arrested during this action. There will be court support for them on Oct. 3. The resistance has inspired plans for more actions, even as Occupy ICE LA continues to hold weekly events. The vow is to continue to fight until ICE and the system that creates these terroristic, fascist forces are abolished.